Battlefield General: Is Bobby Jindal Making Sense? Louisiana Governor Bobby Jindal speaks to the media during an update on BP's massive oil spill. Cleaning Up on the Oil Spill: Who's Making Money? 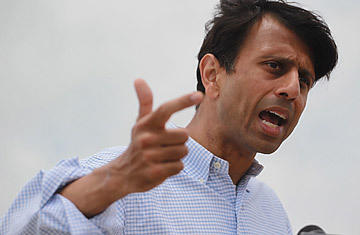 Bobby Jindal, a Rhodes scholar with a skeletal frame, doesn't look like a battlefield commander. But since the Deepwater Horizon rig exploded, Louisiana's Republican governor has cast the fight to protect the state's coastline as a struggle for survival. "The war against the spill continues," Jindal wrote in a typical Twitter post June 21. "We will not wait on bureaucracy or wishful thinking, we will move forward." A year after his wooden rebuttal to the 2009 State of the Union address, Jindal's aggressive response to the spill is paying dividends. In one recent poll, his approval rating in the state jumped to 74%, up 10 points since April. Unlike Mississippi Governor Haley Barbour, who says the Obama Administration has "done more right than wrong," Jindal has tapped into his constituents' frustrations by using Washington as a foil. He has a tendency to beseech federal authorities for help and skewer their efforts as ineffectual in the same breath. The government, he likes to say, should either "lead or get out of the way." The notion that Washington should lead is not the only puzzling position taken by Jindal, a small-government conservative. An advocate of offshore oil exploration, he points to environmental devastation as a consequence of the government's "lack of urgency" but opposes a moratorium on deepwater drilling. But when Washington has provided resources, Jindal hasn't always deployed them. A CBS News study found that he had mobilized only a fraction of the National Guard troops allotted to the state. Louisiana's contingency plan to combat the spill had gaps, and Jindal slashed financing for the state oil-spill coordinator's office. Appraising whether Jindal has met his own leadership standards may be impossible, however. On June 25, citing a desire to avoid compromising future litigation against BP, he vetoed legislation that would have made public all records of the state's response to the crisis. See "Dredge, Baby, Dredge: Can Sand Stop the Oil?" See pictures of victims of the Deepwater Horizon disaster.